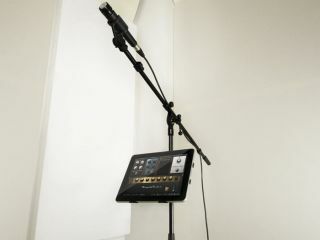 Still vying to be the company synonymous with iPhone/iPad-related guitar products, IK Multimedia has just announced a microphone stand adaptor for iPad, cleverly called the 'iKlip'. "The new iKlip for iPad makes it easy for you to use your iPad in any live setting - on stage, in the studio, at school or in the boardroom. With its multi-angle adjustable design, you can now securely position your iPad for optimal viewing and accessibility, while all controls, buttons and connection ports remain free from obstruction." The iKlip costs $39.99 / €29.99 and is available to pre-order now (ships in December). With the sheer scale and quality of music making apps increasing at a rate of knots (including IK's own recently released AmpliTube 2 for iPhone which, by the way, has done nothing to dampen the company's aforementioned quest), we could definitely find a use for the iKlip, particularly for triggering live effects and instruments.